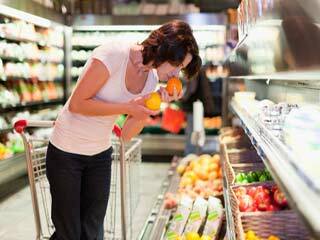 Pregnant women develop sensitivity to smell. This happens in order to prevent inhaling harmful substances. At times the sense of smell prevails even after delivery. The sensitivity may also lead to morning sickness. Have you ever wondered what massive power your nose has suddenly developed to be so sensitive to smell after your pregnancy? Find out all about it. Besides visible body changes that follow pregnancy many women report heightened sense of smell. For a few pregnant women it is an unwelcome change while for others it offers relief. For instance 28 year old media professional, Rashmi, who recently conceived was quite amazed as to how she developed a sudden liking for strong aroma at an ice cream parlour, so much so that she made it a point to visit it at least twice a week. So, if you are pregnant and wondering why you can sniff every possible smell around you, take a quick look at why it is so. It’s a general perception that pregnant women develop sensitivity to smell in order to prevent inhaling harmful substances and in turn protect the foetus even if it is harmless for her. Some studies point at expecting mother’s genetic tendency towards chemical sensitivities. For instance they might be allergic to certain fragrances. Does it wane off as pregnancy progresses? Due to a hormone called progesterone many pregnant women develop swelling in their nasal mucosa later in pregnancy. This mucus dulls their sense of smell. “But in a couple of cases, sensitivity to smell continues even after delivery,” adds Dr Sharma. Does sensitivity to smell lead to morning sickness? Yes, it does cause morning sickness because due to estrogens women become sensitive to strong or bitter smells. Moreover, women who report no such sensitivity to smell or morning sickness are likely to either miscarry or deliver kids with birth defects. The logic is simple – they ingest toxic substances which harm the fetus. Ask your friends and colleagues to be considerate and go easy on fragrances which you can’t stand. Avoid company of those who smoke. Surround yourself with smells that calm your senses. Cook and eat those food items whose smell you can put up with. Keep your room well ventilated. Since clothes hold onto odours change or wash your clothes often. So, whether you’re high on the best of best fragrances or aversive to a few, just remember like other symptoms of pregnancy this too shall pass. Have a healthy pregnancy!